Rick Sheppard, a born entertainer, has been at the forefront of the music industry from the time he can remember. He began performing at the age of nine years old and by his teenage years had a number of local television appearances on his resume. His first real professional engagement occurred in Miami, Florida, opening for Sammy Davis, Jr. Right then, young Rick knew what he wanted to do for the rest of his life. He wanted to entertain. The first several years would see Rick Sheppard on the road in a seemingly endless stream of one-night night club performances. During that time, he was in and out of a variety of groups as well. His career seemed to be lacking a real direction, and then came the telephone call that would change his life. Forever. It seems that a songwriter familiar with Rick mentioned his name to legendary manager George Treadwell. George, manager of The Drifters,was looking for someone to replace Drifter Rudy Lewis. His friend, the songwriter, was sufficiently persuasive so that George Treadwell called Rick Sheppard to see if he would be interested in joining The Drifters. Rick thought the caller was a friend playing a joke, so he hung up. Fortunately, George Treadwell called back, assured Rick that he was, indeed, the manager of The Drifters and that the offer was genuine. After a quick apology and three seconds to think it over, Rick Sheppard said, “yes,” and became a part of one of the greatest hit-makers in the history of contemporary popular music. The rest, as they say, is rock ‘n’ roll history. 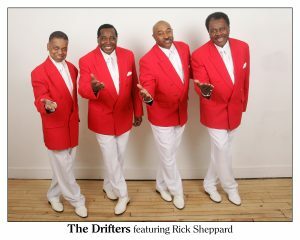 The Drifters featuring Rick Sheppard are entering their fourth decade thrilling audiences in the United States, Canada, and worldwide. Their show is high energy and visually entertaining, mixing the classic Drifters repertoire that fans have come to know and love along with hits from the 1970s and 1980s done up in the unique Drifters style. In 1996, they released two albums on Capitol/EMI Music: a re-recording of The Drifters “Greatest Hits” and “A Christmas Album”, the first ever album of classic Christmas songs recorded by The Drifters in their long and illustrious career. In 2010, a song from that Christmas album (“The Bells Of St. Mary’s”) was featured in the motion picture “Lymelife.” The “Greatest Hits” album includes “There Goes My Baby,” a two-million seller that was the first big R&B record to feature violins, as well as a number of the groups twenty additional chart hits recorded over the ensuing decade. 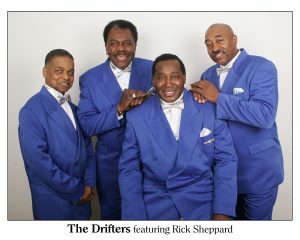 In all, The Drifters have sold more than 100 million records. In 2011, Rick Sheppard was honored by his hometown of Queens, New York as a Queens, New York Legend celebrating four decades of entertaining the world at a ceremony attended by family, friends, and local dignitaries. During the ceremony, Rick received proclamations of appreciation from local, New York City, and New York state officials. Rick Sheppard has been doing what he loves: singing, dancing, entertaining. And, he’s been doing it for most of his life. Forty five years is a long time. Here’s to years and years to come!